Conflicts. In my heart, I really do want the First Amendment of the United States Constitution to protect me. Protecting you, I’m not so sure about. 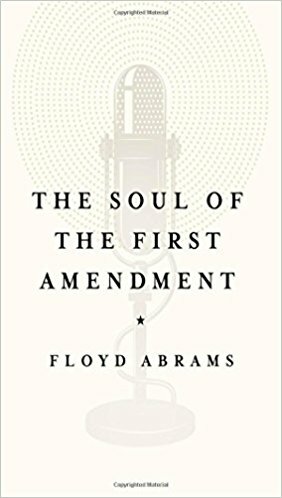 Floyd Abrams has specialized in first amendment issues, and he explores the broad protections of that amendment in a finely written book titled, The Soul of the First Amendment. I especially enjoyed his review of the conflicts, current and historic, between free speech and national security, especially in the form of publication of classified material. Every citizen can benefit from some time thinking more about the first amendment, and I recommend this book as a way to stimulate that thinking. After reading it, you may be willing to accept that even I should be covered by this amendment. I’m almost ready to accept that you deserve the same treatment. Rating: Four-star (I like it) Click here to purchase The Soul of the First Amendment from amazon.com.